An interview with Kairos, the developer of Varia and Kairuga. Let's begin with a short introduction about yourself, for readers who are unfamiliar with your works. I'm a 16 year old teen who likes to play shmups and also make them. I only make releases like once a year due to school and whatnot. My two releases include the shmups Kairuga and Varia, both have the glowy vector sort of feel to them. How did you start off with game development, and since when? A bit of history would be great, considering that GM users are getting younger and younger every day and they need all the help and pointers they could get. I started doing real work back in the end of 2005. I used to play all the quality games made in GM and wonder how someone could make that in this program; I started experimenting and learning by example for the most part, and then finally made a real game and released Kairuga during the summer of 2006. The one thing I would recommend to kids who want to develop games is that it is no easy task to create a good game that appeals well. They should remember that the hardest part of development is finishing the game itself. How does it feel to win the latest Shmup-Dev Competition? It's quite an achievement, considering that past winners and runner-ups have joined the same compo as well. It feels great, really. I didn't expect that I'd win, considering I originally joined the competition not for the sake of winning, but just for fun. Some encouragement from a few respected people and a bit of thought and it just ended up like that. And who exactly are you referring to as the 'few respected people'? Cactus, Bill of the2bears, and some close friends of mine. Are you planning to participate in the next Shmup-Dev compo? If you hadn't won, who did you think would win? And which entries are your favorites? I was expecting Linley to win, Garden of Colored Lights was very unique and appealing. My favorites included GoCL, Akuchizoku and Kamiha. Name some of your favorite GM releases by other developers. Clean Asia, The Cleaner, the Jumper series, and Immortal Defense. There are probably more but those are the more recent ones I've played. Alright, the juicy stuff. Are you working on anything right now? The online RTS? What's the status of that project? And when can we expect another release from you? 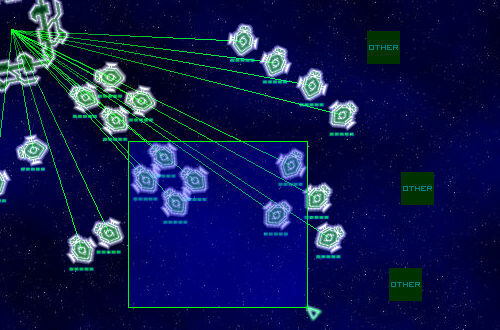 I am currently developing the engine for the online RTS, though little has been finished at this point. Currently I'm in the stage of thinking up the design and gameplay part, and you can probably expect a release of that next year sometime. I might release one or two smaller games before that happens, though. After your Shmup-Dev competition win, and considering the fact that Varia is sitting pretty at the No. 1 spot on the YoYoGames web site, understandably some GM users will probably drop out of the YoYoGames Winter Competition if they knew you were participating. So to get a final word from you - will you be making a game for the YoYoGames Winter compo? Unfortunately, no. It would've been a great deal of fun and I was actually planning to at one point, but unfortunately that building I go to five times a week gives me too much stuff to do. What kind of setup do you have at home? Next-gen consoles? Have you ever considered working in the games industry, perhaps making games for Xbox 360 or PS3? Actually, I don't own any next-gen consoles. Basically the computer provides me with all my entertainment. I'm planning to get into the games industry at some point in time, so yea, making games for the PC or consoles sounds very appealing. Do you see yourself using GM for the next five years? I definitely see myself using GM past that period of time. It's such a great tool to simply churn out stuff or do fast prototyping in - I'll continue to use it till who knows when. What do you think of the current GM scene, and also indie games in general? I see that there are plenty of talented GM users that can prove to people that the program is not just some toy - there are lots of games that push the limits of it, some games even selling for a decent amount of money. As for indie games, I think that the public should be playing them as much as commercial games are being played. You can't just not play Cave Story, for instance. Name a couple of your favorite shmups, commercial, console releases or otherwise. Raiden 2, Ikaruga, R-Type series, Gradius series, G-Darius, Radiant Silvergun, rRootage, Warning Forever, just to name a few. And a screenshot from one of your upcoming projects?